This tutorial shows you how to change the slide timings for the slides accompanying a presenter video. 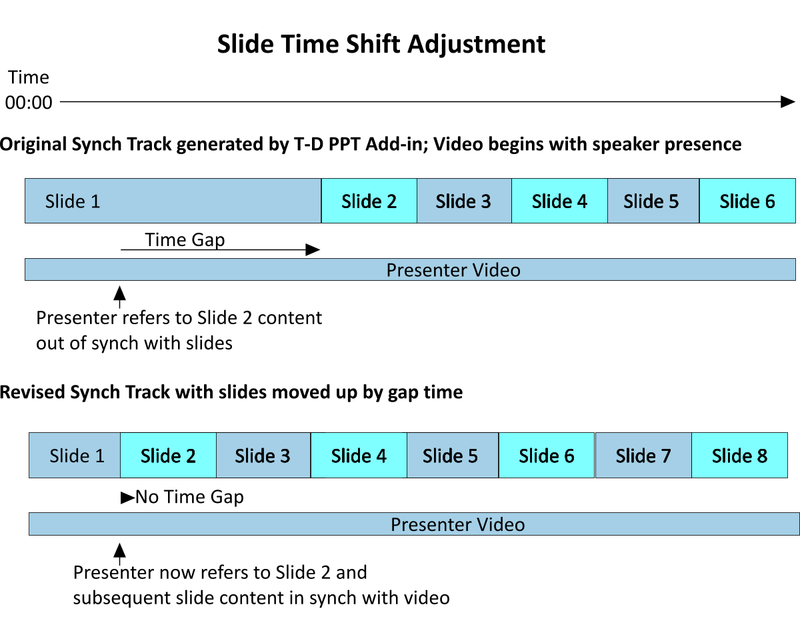 Another reason for changing the timing of an individual slide or slides to a different position on the synch track is because for one reason or another, when the presenter delivered the presentation, he miscued one or more of the slides, and you want to tighten up the timing to more accurately reflect when the slide or slides should have appeared. This tutorial will show you how to change both multi-slide and individual slide timings. This tutorial will use the same video and PowerPoint slide files as Tutorial 1. However, the slide list file used in Tutorial 1 has been revised to create timings that are out of sync with the presentation as originally presented. The number two and subsequent slides have been set back 30 seconds from their original positions in the presentation. As well, the number 10 slide has been moved five seconds out of position. You will change those timings to bring them into sync with the presentation as originally presented. If you haven’t logged in, do that here now, top right corner. 3/ Locate the original sample Video and PowerPoint slide files from Tutorial 1 on your computer. On the Talk-Deck.com front page, press ‘Upload’ in the top right corner to create a new presentation. (You have to be Registered as a User, and SignedIn to create a Talk-Deck presentation.) After pressing ‘Upload’ you will be taken to Tab 1 of the Talk-Deck Creator/Editor. Fill in at least the Title field (mandatory), and the rest of the fields if you want. Press ‘Save’ and continue on to Tab 2. Sometimes, as explained above, you need to change multiple slides at one time. In this tutorial, we are going to tighten up the 30 second gap between where the #2 slide is currently, which is 39 seconds, and where it actually should be located in the presentation which is 9 seconds, by advancing all the slides in the presentation from slide #2 on by 30 seconds. To do this, in Tab 2, go to the slide list editor below the slide list upload panel. Type ‘2’ into the ‘time shift #’ field and ‘30’ into the ‘seconds’ field. Then press the green ‘Go’ button to the right. The Creator/Editor will then advance the timing of all slides by 30 seconds, starting from slide #2. If you look again at the ‘Timeline Editor’, you will see that the #2 slide change time is now :09 seconds and the #20 slide has a change time of 2:16. These are the correct times. We have advanced the time of all slides relative to the #1 slide by 30 seconds. Now that you have corrected the entire presentation with a multi-slide change, we will have you change the timing of one slide only. This can done in two ways. One way is to change an individual slide change time in the Tab Two timeline editor. The second, and we think easier way, is to change the slide time using the Timeline Editor in Tab 3. The reason for this is that the Tab 2 editor is a simple table editor which is great for multi-slide changes. The Timeline Editor in Tab 3 however, has playback screens for both video and slides, along with sound, and precise video editing controls. So you can achieve more precise timing changes using the Tab 3 Timeline Editor which is useful for matching individual slide changes to the presenter’s exact words. So press the ‘Save’ button, and go to Tab Three, and then go to the ‘Edit’ sub-tab. The slide time we want to change is for the #12 slide. If you scroll over using the scroll or bar to the #12 slide, you will see it is at 1:47. We want to change this to 1:37. To this, put your mouse over the #12 slide marker at 1:37 till the double ended arrow appears, then click and drag it over to 1:47. Press ‘Save’ and you’re done. You can change any other slide the same way. Note that you can also do multi-slide changes the same way. Just change the slide adjustment to ‘Multiple’, leave the drop-down field label at ‘All’, and then move the #2 slide over to the revised time position you want your series of slides to begin at. And that’s how to change slide timings using the Talk-Deck Creator/Editor. If you compare your new presentation to the one on the Talk-Deck front page, they should now be identical in timing. Now let’s move on to Tutorial Three, which shows you to install and use the Talk-Deck PowerPoint Add-In to automatically record slide timings when you turn a live presentation into a Talk-Deck.